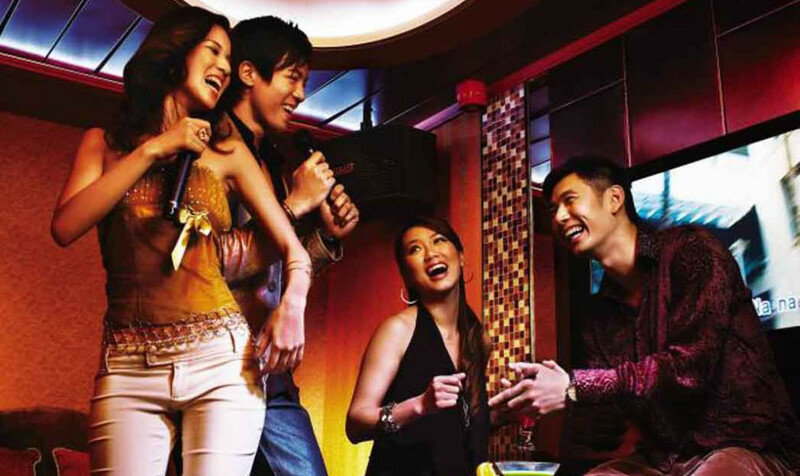 I spent a couple of hours in a karaoke bar in Singapore and didn’t buy a drink. Or sing a song. But that was because one drink cost more than some Air Asia flights and I had to escape from mini-skirt wearing girls trying to pick me up before I got a chance to sing. It’s Chapter Eight of Brian’s Karaoke World Tour and although I was in Singapore doing research for my book Tell Them to Get Lost I couldn’t pass up a chance to add another country to my list. There was a whole line of Karaoke bars near my hotel and I picked the largest one with the biggest crowd – although the room was so dark it took my eyes a while to adjust before I could actually see the crowd. I was escorted to a table and given a drinks menu. It was then that I almost fell off my stool – a small glass of beer was $13! ‘I’ll wait a bit,’ I said to the waiter. Picking a song was very hi-tech. Around the room were computer screens where you simply scrolled through the song list on the touch-screen and picked your song and put in your table number. When your table number flashed up on the TV screens, the waiter handed you a microphone. I did get a little confused with the song list, but a very friendly local girl in a very tiny mini-skirt helped me (very friendly in fact – she put her hand on my knee while she helped me). On the way back to my seat I noticed lots of very friendly local girls in tiny mini skirts with their hands on mens knees. Men who were probably double their age. Ah, I was in a hostess bar. These girls were flirting with these men and laughing at their bad jokes, so the men would buy them very expensive drinks (and the girls took a cut from the bar). I left after an hour. I waited to sing, but my song was way down the list. Plus the waiter was getting a bit pissed off with me saying that I hadn’t made up my mind about what drink I wanted. And, worst of all, my ears couldn’t take the men singing soppy wailing Mandarin love songs to their ‘dates’ any longer. Karaoke World Tour – Switzerland. Karaoke World Tour – Russia.